This weekend my fiancee and I went to a wedding convention at the large downtown conventional hall. It is a show for all wedding-related vendors to set up a booth and try to get your business. In order to get your business, they tempt you with free stuff; lots of it, and high quality. The best are the food caterers and restaurants. They bring their best appetizers and entrée samplers. And for dessert, if you like cake, you are in business. I've never eaten such a large variety of cake in such a short time. There were also fashion shows and other 'entertainment' going on if that's your thing. For me, the food and cake made my day. If you use something often, find a way to use a reusable item instead. Buying the same thing again and again wastes money you could be saving and investing. If your office/school/place you go everyday has a water cooler or a water fountain, then do not buy bottled water. Buy some sort of mug or container that you like, and fill it up for free. You can save a hundred dollars or more a year depending on how much you drink. And I hate to be the one to break this to you, but it's the same water. If you make your own lunch and bring it to work or school, you are already saving hundreds of dollars a year; good for you. However, if you are using disposable lunch bags and zip-locks, you are also throwing away money. A brown bag is just a waste. Get a nice permanent lunch bag and you save money for the rest of your life. Also, instead of zip-lock bags, you can buy reusable sandwich bags. I got some and they're pretty neat. You just rinse them off and let them dry over night, and they are ready to use the next day. 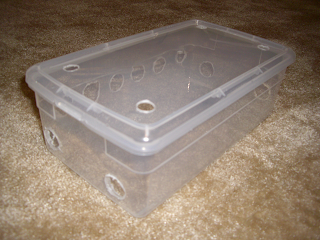 And if you actually make something better than a sandwich, invest in some nice plastic boxes. This goes without saying; Don't ever buy batteries! Get a good set of rechargeable batteries, and recharge them. Don't waste money burning data on to a CD or DVD every time you just want to bring something with you to work. If you aren't going to keep that data around, you're hurting the environment, and your wallet buy using permanent media. USB sticks are cheap, small, and convenient. Get one, and use it to bring digital data with you. First, don't buy disposable cameras. Second, if you still have a camera that takes film, you better be a photographer. If you want to save money, you should buy a digital camera. Not only will you save money on film, but you will also save on prints. You no longer have to waste money on an entire roll if you just want a couple of photos printed. But even better, you can email your pictures, or use a free online service like Flickr or Picasa and save even more. How often do you wipe up a little spot of water with paper towels, or dry some dishes with paper towels, etc.? You might as well dry them with dollar bills. Using paper towels is so wasteful. How did that become so prevalent in our kitchens. A good hand towel for drying dishes and water spills will save you money, and helps the environment. Paper towels have their uses (tomato sauce comes to mind), but not for that small spot of water next to the sink. If your goal is to save money, then don't waste money buying things you could be reusing. While you are buying bottled water and batteries, I'm investing in stocks and making money. I had a hair dryer that just stopped working. The last thing I wanted to do was spend more money on a new one. So I looked around, and by chance I still had the box and instruction manual. The hair dryer had a 2-year manufacturer's warranty. I didn't have the receipt, but the date of manufacture was less than two years ago, so I was in business. I mailed it away and waited. And after a month of wet hair, I got a brand new hair dryer in the mail. It cost around 5 dollars to mail it, and they charged 5 dollars for shipping and handling. 10 dollars is much less than the 30 - 35 dollars it would have cost for a new one. In the past I've had other things break or stop working and just bought replacements without considering the factory warranty. Don't be a fool and waste money on a buying something new when you can get it fixed for free. And often times, like I experienced this time, you'll just get a new replacement in place of the repair. Save a little warranty information, and you can save a lot of money in the long run. Everyone seems to be worried about the economy these days. As a result, the market is tanking. People freak out and want to cut their loses, so they sell everything and get out. Those people are fools. Now is the time to invest more money in the market. Almost everything is down. Rule number 1: Buy Low. Everything is low now, tech stocks and financials especially. Apple and VMWare are two great examples of stocks you should buy right now. They are down a huge amount, but not because they are doing poorly. They are down just because the rest of the market is down. Both of these companies are increasing profits, and more importantly, have great future prospects for increasing market share and revenue. They will go back up; it's just a matter of when the market settles. Instead of trying to cut losses, you should look toward future gains. Another sector of stocks trading at great prices right now are the financials. Wells Fargo and Bank of America are down because of the market, and because of the sub-prime mortgage nonsense, and a lot of other factors. However, this is all relative in the short term. These are huge banks and they will go back up. Now is the time to invest in them. And let's not forget about Citi! When the market as a whole is down, your first reaction might be to sell and save from losses, but the market usually makes its correction and will settle, and go back up. But in the mean time, the best opportunity to buy is when everything is down. A recession is great news for an investor! A great way to save money is to do something yourself. I have all my computer stuff in one corner, and it's a big mess. 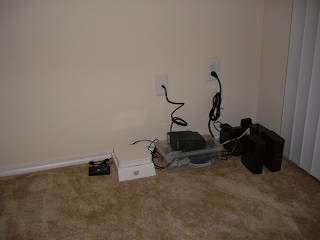 My goal was to organize and clean up the clutter from all the wires and power cords. I went to stores like Office Depot and Best Buy to see what my options were, and they were all the same: expensive. CompUSA had a computer cable organizer for $75, and it didn't really remove the clutter. No way I was spending that much money on a piece of plastic to wrap my cables around. So to save myself money, this became a do-it-yourself project. I wanted a solution that looked nice and neat, but did not cost me any money. 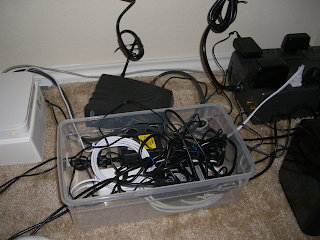 At first, I considered a shoe box, but the power cord transformers can get really hot, so it seemed like a fire hazard. So I went to the store looking for something similar to a shoe box. I found the following at the Container Store. It cost $1.99. I drilled holes in the top for air flow, and holes on the sides for cables to pass through. The next step was to pack everything in the box, with the wires passing through the holes. I tied the wires up with twisty ties to pack them in there nicely. The twisty ties only cost 1 dollar. Actually, I could not find just twisty ties. I checked the dollar store and Big Lots. So I had to buy some plastic storage bags to get the ties. After everything is packed in the box and the cables and power cords hooked up, all that was left is to close the box and arrange everything into the corner. I think it looks pretty good for the amount of time and money spent. 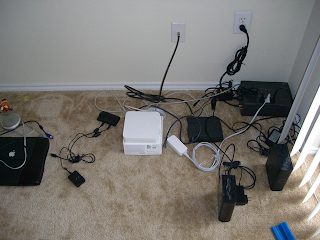 It is definitely better than the mess of cables and power cords owning up the floor space before. Everything is neat and packed into the corner. The lesson is don't spend a lot of money on something if you can do it yourself for cheap. There are tons of ways to save money, but nothing beats free stuff. I was surprised to see how many companies give away free stuff all the time. New product releases and promotional items are just given away to get the name out there. You just have to know when and where to get the free stuff. These two sites do just that. These two sites have deals every day that you would never know about. But better than the deals, is the free stuff. All the time there are coupons for free stuff. I've gotten free Smoothie King smooties, free Power Bars, Cliff Bars, Zone Perfect bars, even yogurt. These sites have an RSS feed so it's really convenient to check. Just look once a day and see what comes up. Often they are limited time offers so you have to check daily. These sites will make sure you don't miss out on things like free-scoop day from Ben & Jerry's and Baskin Robbins. Free stuff saves you money, and is awesome.